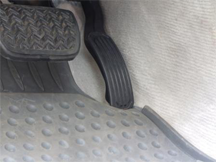 Example of an unsecured driver-side floor mat trapping the accelerator pedal in a 2007 Toyota Lexus ES350. In 2009, Toyota recalled approximately 3.9 million vehicles. No investigation to date has uncovered any irregularity in Toyota's recall decision and certainly there is not evidence sufficient to conclude that lock-in played any part in preventing an earlier recall. Lock-in occurs in group decision making, when groups engage in, for instance, negotiations, politics, diplomacy, war, management, and problem solving. It happens when groups fail to adapt to changing situations, rejecting or failing to see alternatives to their choices even when those alternatives are clearly superior. Instead, they escalate their commitment to the chosen course. Knowing the indicators of lock-in can be helpful to anyone who wants to move a group toward alternatives. Here are four indicators relating to the history of the group's decisions. Although the group's decisions depend on both its composition and its current perceptions of the problem, they also depend on the path the group traveled in arriving at its current position. The path traveled determines the state of knowledge within the organization, the hires made, the consultants known and trusted, the sites and locations that were developed, the equipment and software acquired, and many more personnel and physical factors. This history can cause decision makers to persist with a solution beyond the point where they would have if they had a different history. Closely related to path dependence is the need for justification. The need for internal justification can arise when the decision makers have personally supported choices that led to the current situation. By escalating commitment, they hope that the eventual outcome will justify to themselves both the choice they are now making and all their past choices as well. External justification is similar, except that the audience of the justifying action is the group's perception of others' assessment of the group's performance. the decision makersoutside the group, inflexibility is both an obvious indicator of lock-in and difficult to understand. For seemingly unfathomable reasons, decision makers reject alternatives that seem promising. Because seeming inflexible or irrational can be damaging to one's career, groups that adopt inflexible positions do so most often in desperation. They feel beset. They feel that adaptive behavior will make them seem weak, and thereby cause more damage than inflexibility will. Closure, or exclusion, of alternatives does not present inherent difficulties in achieving high-quality decisions. However, premature closure of alternatives, or continuing exclusion of alternatives in the face of repeated failure, does threaten decision quality. When a group enforces or accepts closure of alternatives in the face of failure of its chosen course, lock-in is likely in place. One exception: a person or people who have power over the group's decisions can impose closure. In this case, the lock-in has occurred not in the decision-making group, but in the mind of the person executing the closure. Would you like to see your comments posted here? rbrenrSvwwKmEyaGwoLdUner@ChacMJEwMswqrhQAGFVXoCanyon.comSend me your comments by email, or by Web form. I offer email and telephone coaching at both corporate and individual rates. Contact Rick for details at rbrenLxGvFMEltiCckgXDner@ChacHuJtzDQpPmxFeZPVoCanyon.com or (650) 787-6475, or toll-free in the continental US at (866) 378-5470.